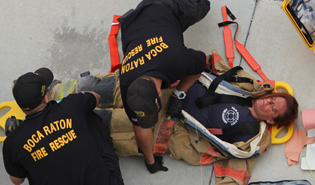 Many instructors and staff for the Emergency Medical Services programs at Palm Beach State College also work for local fire-rescue departments. Ask any student—no one makes learning more relevant than a professional who’s just come off shift, such as Battalion Chief Bruce Arbeit or Lt. Jorge Cardoso, firefighter. 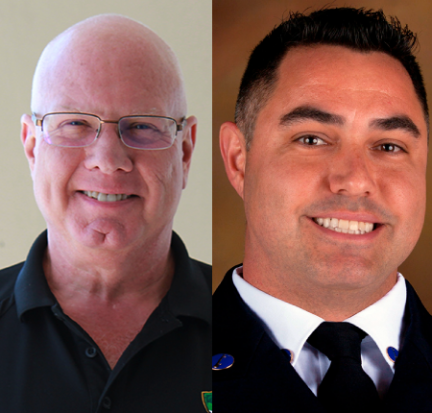 Arbeit and Cardoso were both recently recognized by their other employer—Palm Beach County Fire-Rescue—each winning the annual top prize for their rank. 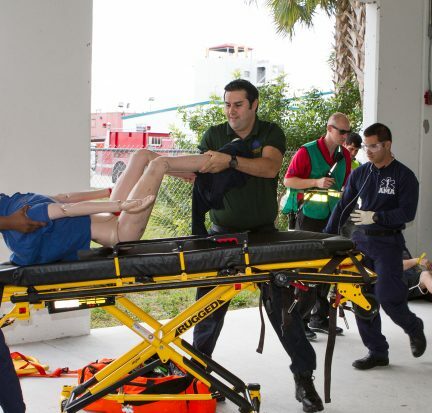 Emergency medical services teams from around the state competed at Palm Beach State College’s third annual Panther EMS Challenge, held April 15 at the Public Safety Training Center on the Lake Worth campus. The fast-paced competition tested the teams’ knowledge and skills in advanced life support through a series of demanding, realistic medical scenarios that involved full-body human patient simulators (wireless, computerized mannequins) as well as people portraying patients. 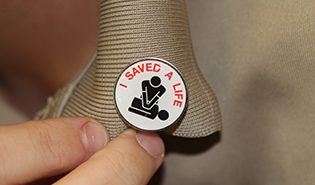 Out-of-hospital cardiac arrest is a leading cause of death in the U.S. Once a heart stops, despite all efforts by paramedics and emergency medical technicians, it’s extremely rare to get it started again. Even if successful, the patient almost never fully recovers. Professional emergency medical services teams from Palm Beach, Broward and Miami-Dade counties competed today in Palm Beach State College’s first EMS Panther Challenge, held at the Public Safety Training Center on the Lake Worth campus. The teams’ knowledge and skills in advanced life support were put to the test in dynamic, realistic medical scenarios that involved human patient simulators (wireless, computerized mannequins) and people portraying patients.